B.The Tool Angle Sample provides a visual reference to use if your grinding goes off course. It can also be used as a valuable set-up tool for the Side Grind Jig (figure A). 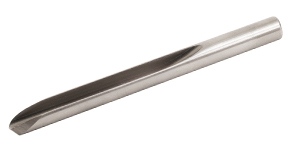 The Tool Angle Sample is made out of 6 long, 5/8 diameter mild steel and has a 1-1/2 long flute cut in it.